For requesting evidence of Russian culpability in the poisoning of former spy Sergei Skripal and his daughter, UK Labour Leader Jeremy Corbyn has been denounced by PM Theresa May and even members of his own party. We discuss the case with Stephen F. Cohen, Professor Emeritus of Russian Studies at New York University and Princeton. 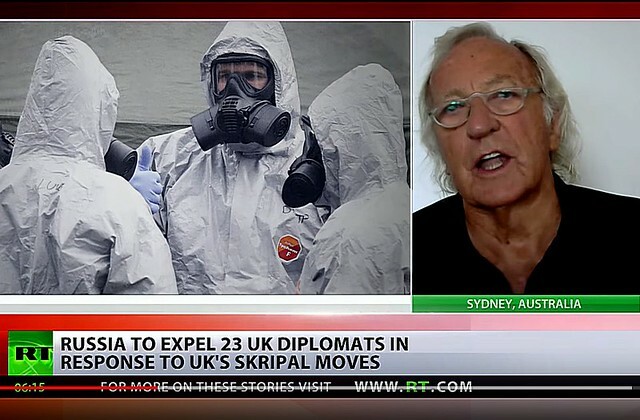 This entry was posted in All Posts News Politics and-or Videos, Crime, Dandelion Salad Videos, England-UK-Britain, Imperialism, Propaganda, Russia and tagged Cold War, Jeremy Corbyn, John Pilger, Novichok Nerve Agent, Russiagate and/or Russophobia, Sergei Skripal, Stephen Cohen. Bookmark the permalink. Such grotesque pantomime is truly shameful; to equate this vulgarity with ethical governance under the rule of law, is a monstrous depravity ~ nothing short of mob rule and extremely reckless. When the coherent facts eventually emerge, it may well unhorse the current UK regime. Tant pis! All the noble leader of ‘Her Majesty’s Most Loyal Opposition’ is demanding, are the minimum requirements of accepted jurisprudence, adherence to obligatory due process and scrupulous compliance with all relevant & binding protocols. So….. Thank you, David, so very well stated! Hope you’ve been well. Cheers!